Music to entertain children, and to inspire joy and compassion. Timeless classics as well as choice songs written or popularized by such artists as Pete Seeger, Burl Ives, Raffi, and The Beatles. David’s original children’s song encourages us to acknowledge and share our feelings. 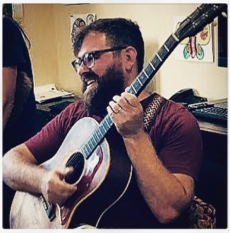 After over 20 years playing “grownup music” in the Bay Area, as a solo singer/songwriter, and a guitarist and bassist in numerous bands, David Grashton became a father. As he tried to give his son a sense of music history, the little Grashton fell in love with the music of Pete Seeger, who was also the first artist David’s parents took him to see when he was a kid. Learning his son’s favorite songs to play for him at home inspired David to turn his talents to children’s music.